Steve Novick: Blogging "a way for a number of people to waste a vast amount of time"
Courtesy of the Senate Guru, we've just learned of a disturbing development in Oregon's Democratic primary for U.S. Senate. Earlier this week, Portland Magazine Willamette Week interviewed the four Democratic candidates competing to be the party's standard bearer for November, including Jeff Merkley and Steve Novick, who have attracted the most support. Willamette Week interviewer: The blogs...do you think they've helped or hurt the Democratic nominee's chance to win in November? Speaker Jeff Merkley: I think that the blogs help, because they are going to spread a lot of information. [...] We have some incredible progressive talent here... And that word is going to spread - about the fact that Oregon has enormously progressive candidates to take on Senator Smith. Steve Novick: Uh...I have no idea. They are...I mean, I think that they provide information to some people. They're also a way for a number of people to waste a vast amount of time. But probably they're the only ones that suffer from that. I can hardly believe Novick actually said this, but you can see it for yourself - it's all on video. I've observed before that Oregon's netroots community is split between Novick and Merkley. Novick has many supporters online, so why is he dissing people who have invested time building new media? First he says he has "no idea" whether blogs have had an impact (positive or negative) but he doesn't stop at that. He then suggests that they're "a way for a number of people to waste a vast amount of time." Given how hard Novick has tried to present himself as a people's insurgent against an establishment rival, I can't help but conclude he's done himself some damage with these comments. Whether or not his supporters get upset about this remains to be seen, but Novick has already managed to lose favor with us. Merkley's answer, on the other hand, is what I would expect to hear from a Democratic candidate who appreciates the value of the netroots community. Democratic Senate candidate Steve Novick says the most qualified candidate in the race besides himself is not one of the other Democrats but independent John Frohnmayer. Novick, a Portland lawyer and consultant, does say that he would back his chief rival, House Speaker Jeff Merkley, if he wins the nomination. But he told The Oregonian on Thursday that Frohnmayer "would be a better senator than Jeff Merkley." Novick's views, first broached in a Willamette Week interview posted on the Internet, is another example of Novick's willingness to break with his party. Novick, Merkley and two other candidates in the Democratic primary, Candy Neville of Eugene and David Loera of Salem, were asked in the weekly newspaper's joint endorsement interview who in the room they would support if they couldn't vote for themselves. Merkley immediately said he would back Novick. But Novick said, "I'd vote for John Frohnmayer." When he was asked what other Democrat he would support, Novick paused for a long time and said, "I have a hard time answering that." Eventually, Novick said he would vote for Candy Neville, "given what I know now". Novick's unwillingness to set his differences aside with Jeff Merkley in the interest of party unity is troubling. Jeff doesn't have a problem supporting Steve. So why can't Steve reciprocate that goodwill? Too often the Democratic Party splinters because Democrats can't forgive each other and move on. Beating the Republicans requires teamwork. Jeff Merkley has demonstrated that he's a team player. Steve Novick, on the other hand, has made it clear that he'll be sore if he loses. That's unfortunate. Perhaps Novick's supporters can talk some sense into him before his comments get circulated more widely. We wouldn't mind an apology. In the Willamette Week endorsement interview the other day, I gave a pretty dumb answer to a question about the impact of blogs on politics. Some folks online are blowing my comments up as a betrayal of the netroots, so I wanted to take a moment to apologize for my statement and clarify what I was trying to say. The truth is that blogs and the netroots are doing a lot to beat Gordon Smith and they are doing a lot to help my campaign. We appreciate your response, Steve - and we accept your apology. David Ammons, dean and president of the Washington Capitol press corps, has been appointed communications director for Secretary of State Sam Reed. Ammons, 59, is political writer and columnist for The Associated Press, and is one of the country's senior statehouse reporters, with nearly 37 years of experience. For the past five years, he has hosted "Inside Olympia," a weekly newsmaker interview show on TVW, Washington 's version of C-SPAN. He has been president of the Capitol Correspondents Association for more than 25 years, and has covered eight governors, presidential elections and annual legislative sessions. "I have admired David Ammons for many years for his professionalism, fairness, integrity and knowledge," Reed commented. "Since this office has huge challenges ahead in terms of implementing a new state primary system and building the Heritage Center , I'm delighted that a person of his stature and reputation agreed to take this key position in my office," he added. "My political reporting career has been endlessly fascinating and rewarding, and I've enjoyed working with some exceptionally talented colleagues in bringing state government to readers, listeners and viewers across Washington ," Ammons said. "I'm excited about this new opportunity to work with an agency and a Secretary I've long admired. I particularly look forward to working in fields of longtime interest, such as elections, civics education and heritage projects and our fascinating history." The Olympia press corps will look very different without Dave Ammons there. I'm so used to seeing his analysis and weekly columns...it will be strange to read the AP state wire with his byline absent. I first met Dave several years ago when I was fighting Tim Eyman initiatives, and we've had a number of friendly conversations over the years. I have always appreciated Dave's willingness to talk to me when I've been in Olympia for an event or to testify. He has quoted me or mentioned NPI at least half a dozen times over the last half decade. I'm grateful that he was ready to listen when I had something to say and I wish him the best in his new position. The headline sort of says it all, but in case you're shaking your head in disbelief, let me repeat the news for you: Tim Eyman has written an email to King County Democratic officials telling them he plans to attend the convention this Sunday - and wants time to speak about his latest joke of an initiative! Just wanted to give you a heads up that I'll be attending the two King County conventions this weekend, the GOP's at Green River Community College (12401 SE 320th Street, Auburn) which is Saturday starting at 9:00 am and the Democrats' at West Seattle's High School Gymnasium (3000 California Ave SW, Seattle) which is Sunday starting at 2:00 pm. Eager to come and talk with activists from both parties about I-985, our initiative for this year. During conventions, there's always 'down times' (when votes are being counted, etc.). I'd really appreciate it if you'd tell your district chairs know that I'm eager to speak to each of their delegations about I-985. It'll a great opportunity for Q&A and promises to be a lively discussion. I'm really looking forward to writing a column about my experiences at both conventions and the feedback I receive from the people there. Thanks to both of you for putting together your county conventions - they are always extraordinarily fun and interesting and a fantastic opportunity to interact with other activists who want nothing but the best for the people of the state of Washington. I'll be happy to pay whatever admissions charge is necessary to attend. We've always known that Tim Eyman was arrogant and lacked a sense of propriety... but this really takes the cake. Not only has Tim Eyman sponsored over half a dozen initiatives that are completely antithetical to everything Democrats stand for, but he has been repeatedly rude and mean spirited towards Democratic elected officials, including Governor Chris Gregoire, Speaker Frank Chopp, and Senate Majority Leader Lisa Brown. And Eyman apparently considers himself a Republican, since he has attended Republican National Conventions before as an alternate and went to the 2008 Republican precinct caucuses this year. Remember this? In Lynnwood, nearly 500 Republicans jammed Silver Creek Community Church, sprawling out in a concrete-floored gym and into side rooms. Initiative guru [salesman] Tim Eyman exhorted the crowd to unify behind the party's eventual nominee — especially given Washington's Democratic leanings. "There is no doubt that we have to work extra-hard in a wacko lefty state like Washington state to get our guys elected," Eyman said. "They've got the crazies in Seattle. We've got to come up with more sane people outside of Seattle to make up for them." The 2008 King County Democratic Convention is being held in West Seattle. No doubt it will be completely full of liberty-loving, patriotic, peace-desiring "crazies" who believe in the idea our state and national government is by the people, of the people, and for the people. It's incredible, but these same "wackos" want parks to stroll in, pools to swim in, schools and libraries to learn in, police and fire protection for safety, emergency medical response for life-threatening situations. So why does Tim Eyman suddenly want to talk to Democrats? He attacks us as "wacko lefty crazies" and then, when he wants to engage with us, we're "activists who want nothing but the best for the people of the state of Washington." Is this just another publicity stunt, or does Tim really want to wander into the lion's den and be booed so loudly that the roof of the high school gym hosting the convention blasts off? The Convention is a public event. Eyman has every right to show his face there. But Democrats have every right to give him the polite yet hostile reception he deserves. When and if Eyman arrives, Democrats should come over, meet him, and strike up a conversation. An honest conversation. The kind Eyman never has with his supporters or the press. Eyman should be asked tough questions, like why he hasn't run for office yet (since he thinks Democrats are doing such a terrible job). Or why he thinks it's okay to gut funding for valuable public services. Or where all the waste and fat in the budget is. Is it state parks? Or early childhood education? Or the Puget Sound cleanup effort? Democrats want to know. Feel free to come to our Convention, Tim. Democrats will be taking note of how you conduct yourself...and really looking forward to blogging about the experience. A final reminder that our contest launched March 29th to give the Official Blog an official name will end in two days - at noon on April 12th. Submissions must be entered by United States mail, email, or through our contact form. Your submission must contain valid contact information. (We may consider incomplete submissions in our decision, but if we cannot get in touch with you, you'll be ineligible for the prize). Submissions that are not written or typed will not be accepted. All submissions must be sent in by April 12th, 2008. The electronic submission deadline is at noon; United States mail must be postmarked by this date. Any submissions sent in after then will be ineligible for the prize. Your submission, in addition to your contact information and the word you think we should adopt as the name for our Official Blog, should contain a concise argument in support of your nomination. You may enter as many submissions as you'd like. However, if we deem any of your submissions to be bogus (in other words, spam or silly names that are not submitted in good faith) you will be disqualified from the contest, even if some of your submissions are valid - and even if we choose one of them. You may be humorous in your explanation, but the name you submit to us should be a serious nomination. Nominations consisting of names we already use in our other projects (Journal on Permanent Defense; Dispatch, Outlook, Digest, and Bulletin on Pacific NW Portal) will not be considered. Please submit something original and fresh that we haven't thought of. It must be easy to pronounce. It must sound solid if it stands on its own (like The Times) or with our organization's name in front of it (like The Northwest Progressive Institute Herald). It should not be something that is already in excessive use (for example, Times or Herald). It should not contain a time of day (for example, Morning Herald). This is a blog and this is the age of the twenty four hour news cycle! It should be reflective of our organization's mission to advance the common good through ideas and action. Email. Use feedback (at) nwprogressive (dot) org. United States Mail. Conserve paper and use a postcard! Remember, the deadline is April 12th. You have until then to dazzle us with your candidate for the new name of our Official Blog. Note from the Executive Director: The following is a guest post authored by our good friend Steve Zemke of MajorityRules.org. In the last few weeks Steve has been heavily involved in a neighborhood campaign to stop the Seattle School District from destroying a greenbelt in north Seattle. Because this is is an important issue that needs more attention, we've asked Steve to share his story and perspective with you, our readers. I also want to mention KING5 is airing a report tonight that will feature Steve's work. Please tune in to the five o'clock broadcast if you're able to. 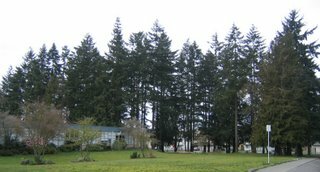 Efforts to save sixty two old Douglas Fir and Western Red Cedar trees from being cut down at Ingraham High School in North Seattle are gaining momentum. Neighbors have collected over six hundred and fifty signatures for a petition urging Ingraham High School, the Seattle School District, the Seattle School Board and the School Design Team to develop an alternative design for Ingraham High School that protects the sixty two large Douglas Fir and Western Cedar trees that are slated to be cut down on the west side of the property. Recent signatories to the petition include King County Executive Ron Sims; State Senators Ed Murray and Ken Jacobsen; and State Representatives Mary Lou Dickerson and Phyllis Kenney. Others include Estella Leopold, Professor Emeritus in Botany at the University of Washington, Joan Thomas, a former President of the Washington Environmental Council, and Marilyn Knight, a former President of the League of Women Voters of Washington. Four Democratic candidates for state Legislature are also on board – Gerald Pollet and Scott White in the 46th LD, John Burbank in the 36th LD and Tina Orwall in the 33rd LD. Senator Ed Murray was the prime sponsor in the Senate of the new Green Cities law that calls on municipal governments to create an inventory of existing trees and develop plans to conserve and retain green areas. Last week both the Seattle Community Council Federation and the Haller Lake Community Club voted to endorse the petition. The school district's plans are thoughtless and ignorant. The state has just enacted a law to preserve trees in towns across the Evergreen State and Seattle Mayor Greg Nickels recently issued an executive order to protect existing trees within the city and plant new ones. The Ingraham grove is merely one place, however, where trees are threatened. There are others. If we cannot stop the destruction of dozens of trees on public property, then no tree in Seattle is safe. It is ironic that Seattle students are learning about environmental protection and the value of trees inside their science classrooms while the school district that is charged with preparing them for life as adults is quietly preparing to chop down an entire grove to add facilities that could easily be sited elsewhere. It's a terrible message to be sending to kids. Trees and forests are incredibly valuable. Even a small forest makes a wonderful habitat. Trees remove pollutants from the air, control water runoff, filter greenhouse gases out of the atmosphere, and provide a scenic, shady area for students and neighbors to enjoy. Neighbors do support the effort to renovate Ingraham High School and build new classrooms to replace the old portables that will be disassembled. But anyone who takes a look at the Ingraham campus could identify better locations for the classrooms to be built. No trees need be cut down. For example, there is a large grassy open space on the north side of the school that could easily accommodate the expansion. What is outrageous is that the Seattle School District did not involve members of the public or neighbors in the planning process. They apparently didn't consider that the larger community (which is paying the bill to build the new classrooms) would not approve of the complete eradication of one of the few large groves of trees still existing in the city. Since the school district has been so thoughtless, it is clear that citizens need to be more vigilant. Voters should scrutinize school renovation proposals more closely before voting for bond issues. And the public should demand a more open process that involves stakeholders from the very beginning. Copies of the petition will be delivered to the Seattle School Board at their Wednesday night meeting. Both the Seattle Times and the Seattle Post-Intelligencer have featured stories about the fight to stop the Seattle School Board from cutting down the trees. I also wrote a post at MajorityRules Blog about the school district administration's decision that cutting down the trees was insignificant. Supporters of Barack Obama in the greater Seattle metro area are planning to hold a rally this Saturday, April 12th, 9:00 AM in Kirkland's Marina Park, NPI has learned. The event is being coordinated by Larry Springer, one of three hardowkring Democrats who represents the 45th LD. If you're wondering why the event is scheduled for such an early hour it's because the rally will be part of a set of simultaneous worldwide rallies. Although various U.S. campaign laws and regulations prevent foreign parties from most types of participation in our presidential campaigns, it's nice to see progressives across the globe are finding a way to show their support. I've always thought it was something of a shame that foreigners can't, for example, run political ads during our campaign cycle. I think Americans could do with a healthy dose of other perspectives. Imagine how things might have turned out in 2000 or 2004 if our allies in Europe and elsewhere had been able to run ads saying "Hey, America! What is up with this Bush guy? Don't you see what an awful impact his agenda is having?" So if you can, mark your calendars for Saturday at 9:00, and head to Kirkland to help pack the park with enthusiasm! The park's address is 25 Lakeshore Plaza Drive; maps and more details are available from the City of Kirkland. During the last election cycle, the Center for Public Integrity ran a series called "The Buying of the President." We are now hearing about fortunes and tax returns and watching the candidates tweak their "branding" during the nominating season. Unprecedented hundreds of millions, truly obscene amounts of money, are being collected not just for coalition building but for ads and tours that resemble those of rock stars. Combined expenditures for the 2008 cycle are set to reach at least a billion dollars. Documenting these developments is a new edition of the Buying of the President. Listen to the podcast ("The Longest Campaign") here or download the MP3. Just this week, the traditional media ran stories about the John McCain (whose wife inherited a fortune worth millions), his situation with respect to his own campaign finance law, the impressive amounts raised by the Obama campaign primarily from small donors over the Internet, and the $119 million the Clintons have pulled in since leaving the White House. The Center for Public Integrity is digging even deeper. If you've got a moment, take a look at what they've uncovered. With the 2008 legislative session and bill action followup finally over, Governor Chris Gregoire is officially launching her 2008 reelection campaign in grand style by beginning a five day, multi-county kickoff tour. Gregoire stopped first in Auburn and Tacoma earlier today and has been journeying south from there. I'm here at the International Association of Fire Fighters Hall in western Vancouver where the governor arrived minutes ago to address a boisterous and crowded room of first responders, activists, and supporters. 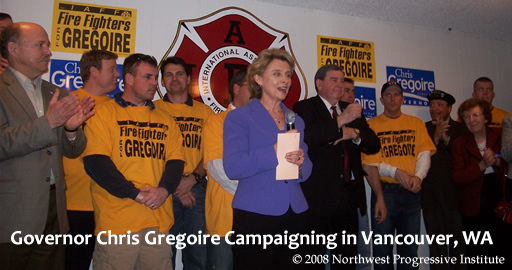 Gregoire was introduced by Mark Johnston of the IAFF, who was himself introduced by Senator Craig Pridemore of the 49th Legislative District. Both Pridemore and Johnston touted Gregoire as a highly effective governor and spoke to the importance of keeping Gregoire as the state's chief executive. The governor is speaking now, taking the wraps off what appears to be the first version of her 2008 stump speech. So far she has touched on a wide array of important topics - among them education, transportation, economic development, environmental protection, and public safety. Unlike several of Gregoire's high profile speeches in 2007, this one has not focused excessively on trade, which is refreshing. Gregoire is doing an excellent job of mixing accomplishments with a strong 2008 campaign platform, contrasting herself with Dino Rossi and outlining the challenges she wants to solve in her second term. I was very pleased to hear her mention the defeat of Initiative 912 and the recent A score awarded to Washington by Pew's "Grading the States" report. Pointing to the mess that Republicans have created in our nation's capitol as an example of the disaster that could strike Olympia under a Rossi administration, Gregoire declared, "We will not be, we cannot be, an echo chamber for what's happening there. And if that's what the people want, I'm not their candidate." But if you want to have someone who will continue to stand up and work hard, continue to take on tough challenges and deliver results, continue to fight for our kids and our senior citizens, be proud as a Washington state employee, work for our firefighters and those in law enforcement, stand up for our veterans, make sure we've got a great environment and good jobs, then I ask you to join me on the road to November. The governor has been exceptionally well received by the Democratic faithful gathered here. She has already been interrupted several times with cheers, applause, and chants of "four more years!" And of course, she arrived to a standing ovation. I'm here because we're not done. There's still more to do... I don't want us to turn backward. I think we've got some real fundamental choices to make in November. Do we want a governor who believes in the people of the State of Washington? Who believes in the hope of every single child? Who understands that we have an opportunity to be even greater? Or [do we want] someone who is critical and [uses] fearmongering to [scare] the people of the State of Washington? I want that governor with hope and belief in the people of the State of Washington. UPDATE II: Gregoire has just concluded her address by firing up the audience for the campaign ahead. "Are we ready to win in a landslide?" Gregoire asked, smiling. She was answered with a roar of enthusiasm. The Governor is currently working the crowd - answering questions, posing for photos, and meeting supporters. It's a fine display of retail politics, but what's really wonderful to see is how relaxed and happy Gregoire is. She is having a good time and enjoying the energy in the room. It's a reassuring sign that the campaign will be robust and resilient in the months ahead. And the fact that Gregoire ended the first day of her kickoff tour in southwest Washington indicates she is prepared to travel and engage Washingtonians in every corner of the state... not just the central Puget Sound. One week has elapsed since we first launched our contest to give the Official Blog an official name at the end of March. The contest is open for another seven days, counting today, so you have until then to get your suggestions in. If you haven't heard about the naming contest, check out the initial announcement for background. Going to the state convention! I neglected to mention in my legislative district caucus liveblogging yesterday that two of us will be attending the state convention and congressional district caucus as part of our LD Obama delegations, not as just members of the media. I am one of twenty three Obama delegates from the 1st Congressional District for the 45th LD delegation, and my colleague Jason Black is the first alternate from the 8th Congressional District for the 48th LD's delegation. I was previously a delegate in 2006, but there was little to no competition to go to the state convention then. This time around, hundreds of people were vying to be one of the forty five delegates that gets to go on the next level. Those that campaigned well and made strong presentations that stood out were rewarded. Spokane promises to be a lot of fun. If you're not planning on making the trek to the Lilac City in June, rest assured that NPI will have live coverage of the convention online, all weekend long. The Washington Democratic party held its legislative district caucuses today, so that's where I was pretty much all day. If you were elected as a delegate at your precinct caucus back on February 9th, you were surely contacted by everyone from your local legislative district party organizers to members of the Obama and Clinton campaigns, reminding you to get out and caucus. This didn't happen four years ago, but it's great that it's happening this year because it's is a test of each candidate's ability to organize and mount an effective "ground game" even in states that aren't in the news right now. LD caucus participation matters, because the precinct delegates who were elected in February held what is essentially a new vote today, generating results that may differ from the statewide precinct caucuses. So the candidate who does the better job mobilizing their precinct delegates will get an edge. While it's too early to have state-wide results from these LD caucuses, the data points from the 48th district and from the neighboring 45th are indicative: the February 9th statewide vote went just about 60/40 for Obama vs. Clinton, whereas today's results in those two district both came out at 73/27. That's a 26 point swing for Obama in the two months since the precinct caucuses. Results like that, if they hold up state wide, should put a stop to any arguments that Clinton's campaign has better field organization. Bradley Lake Park, in Puyallup, WA, will be closed while officials look for a young black bear that has somehow made its way into the park. Microsoft gives Yahoo an April 26th deadline to agree to its acquisition proposal. Microsoft is, apparently, quite serious: they're saying they'll begin hostile takeover proceedings if Yahoo doesn't willingly agree to the deal. Translation: "let us buy your company or we'll just go buy up all your stock anyway." Idaho swears in its first female federal judge. Congratulations, Judge Dale! Conservative economic theory tends to hold that Democratic regulation is bad, because unregulated market forces are always better at maximizing benefit for everyone. So then why, when Democrats are in office, do the rich do just as well as every while lower and middle class people see such significantly greater gains versus when Republicans are in office? In another sign of a tightening economy, the March unemployment rate has hit 5.1%, with 88,000 jobs taken off the books. Obama delivered a moving speech yesterday on the 40th anniversary of Dr. Martin Luther King's death. The New York Times reports on how Iraq deployments have hurt the military's ability to respond to other crises that might emerge. Happy Valentine's Day, America! I try not to use too many DailyKos stories for In Brief, because frankly a lot of you reading this have probably already read them. But this one is really too serious to ignore: On February 14th, the U.S. and Canada agreed to let each other's militaries operate within each other's border in the event of a domestic civil emergency. Nice. Care to guess who gets to declare when we have a "domestic civil emergency?" Or who gets to define what constitutes one? Yeah. We tend to think of Europe and Asia as places with "old" history: churches, castles, government buildings, and even homes that are routinely hundreds of years old. Consequently, we Americans often tend to think that Europeans and Asians have a stronger sense of their own history as embodied in their architecture. But, it isn't always so. Silly marketers! The folks who bring us the Abolute vodka ad campaign have ruffled feathers in both the U.S. and Mexico with an ad campaign implying that the U.S./Mexico border was better how it used to be back in the 1800s. A U.K. plan to derive biofuels from sugar cane grown in Kenya is receiving criticism for the impact that converting 20,000 hectares of prime wetland to sugar cane production would have on local bird and fish species. Here's a clever twist on miniature golf involving physics and kinematics simulation. cnet brings us a top-10 list only true geeks could love: best obsolete port technologies. SCART, anyone? 1614: Let's all join together to wish Pocahontas and English colonist John Rolfe a happy 394th anniversary! 1792: George Washington issues the first presidential veto in the newly minted United States. 1930: Mohandas K. Gandhi strikes a blow for Indian economic freedom by marching to the ocean to make salt. The precinct caucuses may have been two months ago, but it's obvious from the turnout here at our legislative district caucus at Juanita High School that interest in the caucus and convention cycle hasn't waned. The auditorium here is packed with delegates and alternates enthusiastic about taking back the White House and expanding our majorities in Congress this year. It's been a fun morning - we've heard from our state representatives running for reelection (Roger Goodman and Larry Springer), State Lands Commissioner hopeful Peter Goldmark, and speakers for Barack Obama, Hillary Clinton, and Darcy Burner. Although I didn't come prepared to speak (my voice is a bit scratchy due to a cold I've been trying to shake off) our legislative chair asked me to address the assembly and talk about the work of the Northwest Progressive Institute. So for a few minutes I talked about how I became involved six years ago. I also described the work that NPI is doing to advance the common good in the Pacific Northwest and across America. And oddly enough, I felt more comfortable speaking off the top of my head with only a minute's notice than I have before (when I've had ample time to think about what to say). Over a dozen people came up to me over the next hour after that asking for the URL, or web address, of NPI's website, and congratulating me on the smooth delivery of my remarks. I suppose if I can address nearly a thousand people with a semi-hoarse voice with almost no advance warning, I shouldn't have a problem coming up with something intelligent to say at our spring fundraising gala. It is taking a while for the Credentials Committee to do its tallying work, and some delegates are understandably frustrated, but most people have patiently remained seated as volunteers prepare the report as fast as they can. Other than the credentials delay, the caucus has been effectively run. The volunteer effort has been strong, there are plenty of refreshments, and the initial sign in process has been well managed. What is really needed, though, is a computer program that can do tallying and compute which alternates may be seated. We're about to split into subcaucuses by congressional district and by candidate to elect delegates for the next level (the state convention, which is the second weekend in June, and the congressional district caucus, which will be held the day after our May 16th fundraising gala). I'll try to update this post with photos as soon as I can. Tomorrow morning, Washington State Democrats will hold legislative district caucuses to select delegates to move on to the state and congressional level. Any Democrat who was elected a delegate at the February 9th precinct caucuses is guaranteed to be seated, and alternates have an excellent chance of being seated as well, because not all delegates usually show up. The following table lists the locations of each legislative district caucus. Note that while most LD organizations are holding caucuses tomorrow, not all are. This morning I received the unexpected and tragic news that my good friend and colleague Keith Deshaies, the Northwest Progressive Institute's Senior Managing Editor, died unexpectedly of a heart attack last night. He was forty three. We are all very saddened by this grevious development. A wonderful part of the NPI family is no longer with us. Regular readers will undoubtedly remember reading Keith's posts here on the soon-to-be-renamed Official Blog, but not everyone knew him as well as his fellow staff members did. What follows is a brief biographical sketch. Keith grew up in Somersworth, New Hampshire, and later moved to the Evergreen State, where he spent the last years of his life. He lived most recently in Whatcom County and worked as an information technology analyst. He also worked as a carpet installer, landscape nursery manager, carpenter, cabinetmaker, accounting clerk, insurance rate coder, technical writer, network administrator, and business process analyst, which gave him a good background on issues facing working families. Keith attended the University of Phoenix and held a Technical Communications Certificate from Bellevue Community College. In 2004, he volunteered to help John Kerry win in Washington State. On August 16th, 2006, he joined the Northwest Progressive Institute as a contributor and was later named Senior Managing Editor. During his one and a half plus years with the organization, he gained a reputation for providing consistently thoughtful feedback to the team, whether it concerned editorial coverage, NPI's direction and growth, or putting together advice for new writers. He was looking forward to attending both Netroots Nation and the Democratic National Convention later this summer. Keith is survived by his wife Jennifer (who is Events Coordinator for the Northwest Progressive Institute) and his loving children. Please feel free to leave condolences and remembrances in the comment thread. MATTHEWS: Let me ask you about... at any time in this campaign, did you have a chuckle that you just couldn't get rid of? Something weird that happened, that was so crazy that you just went to bed laughing about? OBAMA: Oh... I think that, that happens about once a day, you know? But then I stopped watching cable news. Addressing MSNBC political analyst Michelle Bernard, host Chris Matthews [said], "You know, Michelle -- and this gets very ethnic, but the fact that he's good at basketball doesn't surprise anybody, but the fact that he's that terrible at bowling does make you wonder." While showing the video of Obama's bowling, Matthews asserted, "[I]t isn't the most macho form there." Discussing Sen. Barack Obama on the April 1 edition of MSNBC's Hardball, host Chris Matthews asked Sen. Claire McCaskill (D-MO): "Let me ask you about how he -- how's he connect with regular people? Does he? Or does he only appeal to people who come from the African-American community and from the people who have college or advanced degrees?" Nicely done, Chris. You managed to insult millions of Americans in one fell swoop. Not that such a feat is ever difficult for you. Matthews' commentary and behavior to guests and viewers is constantly offensive. It's clear he isn't going to change his ways, so he shouldn't be allowed to enjoy the privilege of being a broadcaster. MSNBC needs to cancel his show and replace it with something meaningful and informative. Gov. Christine Gregoire and 8th District candidate Darcy Burner came within a razor‑thin edge of their opponents in their last contests. But analysts now say that the Democrats have upped their chancing of winning as the state GOP party faces structural problems and GOP efforts to appeal to the state’s large number of moderate voters has been hampered by their strong conservative base. CQ Politics is now changing its rating of the Washington state Governor’s race from No Clear Favorite to Leans Democrat and Washington’s 8th District rating from Leans Republican to No Clear Favorite. CQ cites Darcy Burner's incredible fundraising, work on the Responsible Plan (now endorsed by a total of fifty two Democratic challengers), and well-built campaign as important advantages over an ineffective incumbent. Gregoire, meanwhile, has a very successful record to run on. Her many accomplishments as chief executive will blunt Rossi's attacks as well as his appeal to independent or biconceptual voters. CQ notes that recent polling conducted by the University of Washington shows the Governor faring better against Dino Rossi with voters. Gregoire also has more money than Rossi and is now asking for contributions again following the end of the legislative session fundraising freeze. Many Republicans seem to be under the delusion that 2008 holds a lot of promise for their party. In particular, the GOP is hoping that Rob McKenna and Dave Reichert will be reelected and Dino Rossi will defeat Chris Gregoire. But chances are excellent that just the opposite will happen in all three races. Reichert is extremely vulnerable, Rossi has nothing to sell to voters but himself (all of his attacks so far have been lackluster or worse), and McKenna will be squaring off against a Democrat with a solid base outside of King County in a tough political climate for the GOP. McKenna's reelection to the Attorney General post is no sure thing with Pierce County Executive John Ladenburg as an opponent. CQ's brief is just a confirmation of what Democrats already know: we have strong candidates running in top Washington State races. But that doesn't mean victory is assured. Winning elections requires a huge investment of time, talent, and treasure. We have to be prepared to go to work if we want a government that responsibly takes on our many difficult challenges and listens to the American people.